"I don't believe that just because a correct word is embraced by advocates makes the word any less correct. . . if someone is an outright denier, call a thing by its name." --Bob Garfield, interviewing Seth Borenstein of the Associated Press, in response to Borenstein's suggestion that the AP's decision to stop using the term "climate change denier" is justified because it is also used by environmental advocates. Friday, Oct. 2, 7:30 pm, Vineyard Haven. The opening act of the 2015 Living Local Harvest Festival is a free screening of 3 new episodes of the local documentary series Sustainable Vineyard. Where Did the Bats Go?, Growing Habitat Standards, and Forward to Nature will be followed by a reception and interspersed with Q&As with the film subjects. At the MV Film Center at Tisbury Marketplace. 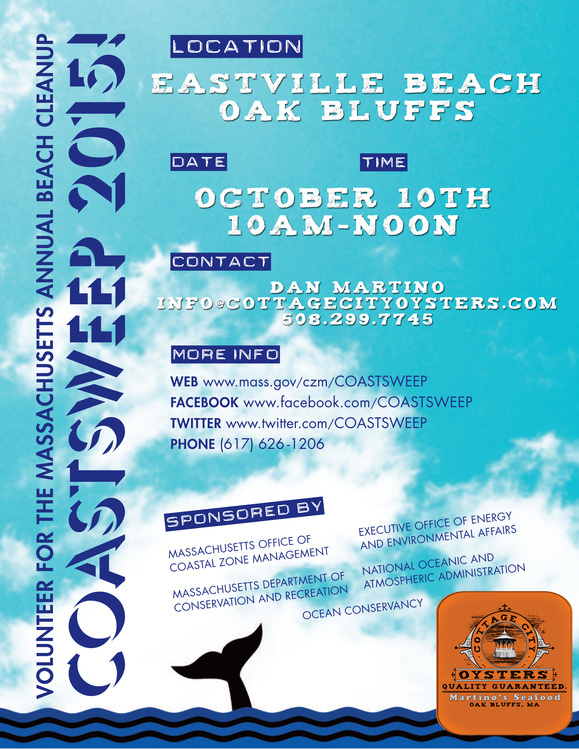 Saturday, Oct. 10, 10:00 am, Oak Bluffs. As part of the state's Coastsweep research program, Cottage City Oysters is organizing a clean-up of Eastville Beach. See poster for more info on the local clean-up. 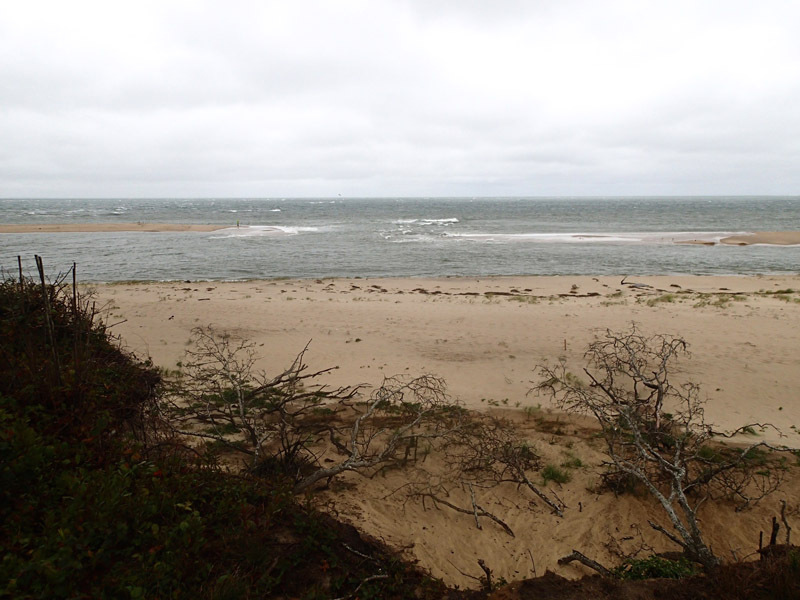 Sunday, Oct. 11, 10:00 am to 3:00 pm, Chilmark. A fun and free gathering at Native Earth Teaching Farm (North Road, near Tea Lane) to celebrate the end of the season. 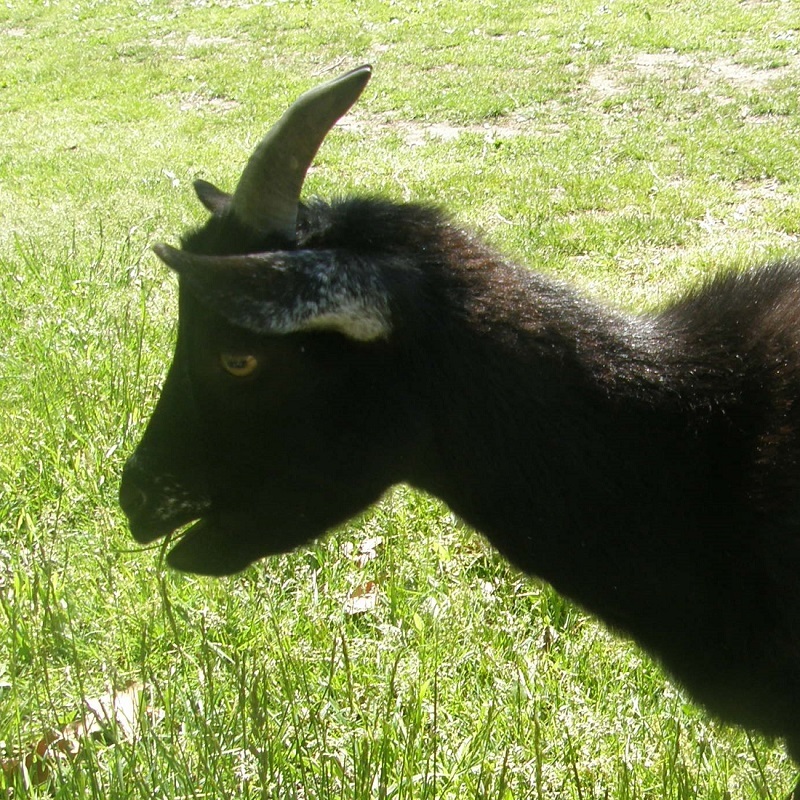 Local food and popcorn for everyone, especially the pygmy goats. More at website. Thursday, Oct. 15, 4:00 to 7:45 pm, Oak Bluffs. Preheat over to 375 degrees and grease a 9 x 13'' pan. For cake batter, first cream together sugar, 1/2 cup butter, eggs, and vanilla. In a separate bowl, sift together flour, baking powder, baking soda, and salt. Add the dry mixture to the creamed a little at a time, alternating with the yogurt. Once those are mixed, fold in the apples and pour into the greased pan. For the topping, mix the brown sugar, cinnamon, and 2 tbsp. butter with a fork and sprinkle over batter. Bake at 375 for 45 minutes or until a toothpick comes out clean. 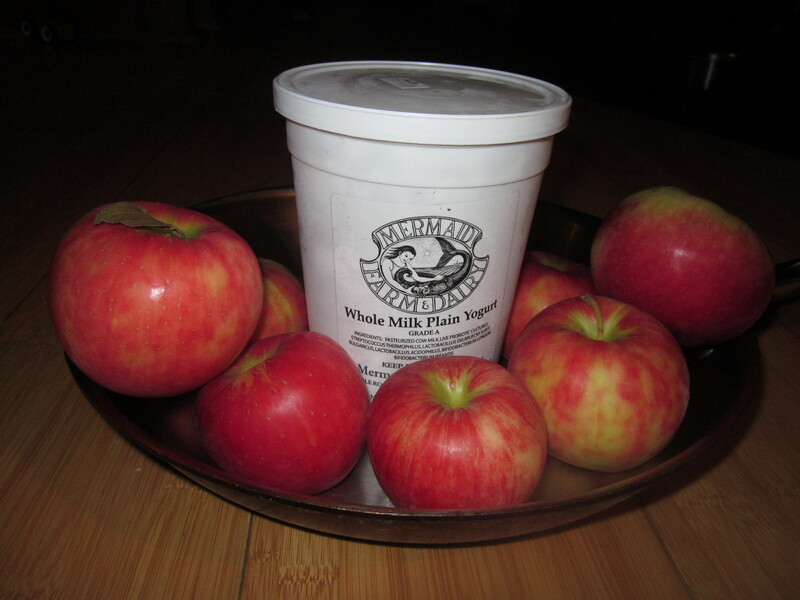 *Whether to peel the apples or not, what variety to use, and how fine to dice them are all matters of taste. But try it at least once with big chunks and without peeling! Living Local this Saturday, Rain or Shine! Join VCS at the Living Local Harvest Festival this Saturday (Oct. 3), from 10:00 to 4:00 at the Ag Hall in West Tisbury. We’ll be featuring a sneak peek at our exciting new advocacy initiative for the coming year along with fun activities for all ages of kids-at-heart. We also plan to recognize the participants in the first annual VCS Island Adventure, so make sure to bring your completed Adventure Book to the VCS table and collect your prize! Due to the unsettled and potentially tropical weather this weekend, the festival will be held on Saturday rain or shine, foregoing the planned rain date on Sunday. Check the Living Local website just in case plans change again, and to see the full schedule of events, activities, games, and workshops. After the festival, there will be a community supper and contra dance beginning at 5:00, with Island-raised pork and local veggies ($15 per person). The annual Living Local Harvest Festival, which has now grown into a major event and community treasure, was originally founded (by four Island non-profits: the MV Ag. Society, Vineyard Energy Project, Island Grown Initiative, and VCS) to promote sustainable living on our island by encouraging local food production and the local economy, renewable energy, and resource conservation. p.s. : Please bring your leftover single-use plastic shopping bags by the VCS table Saturday -- we're collecting them for some crafty re-purposing! 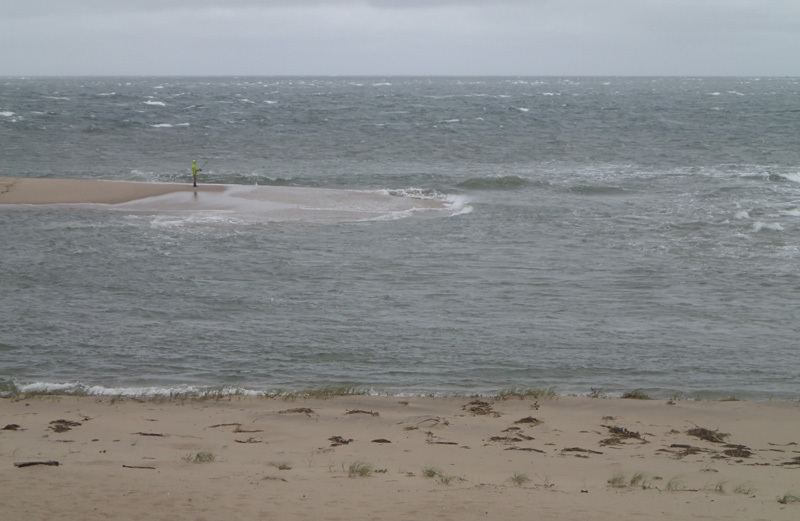 The new breach seen below could be as short lived as the current stormy weather, but for the time being we are two islands yet again. 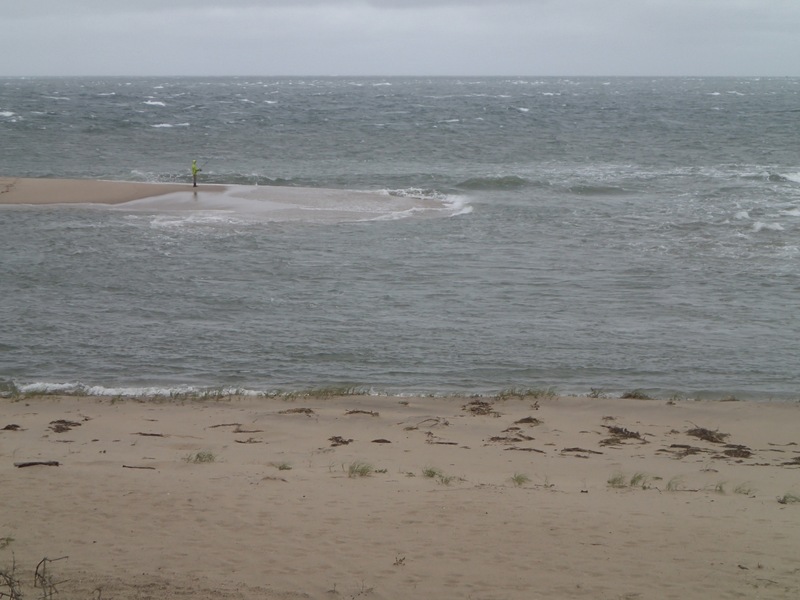 Read more about the recent history of the opening and closing at Norton Point at the Cape Cod Times. To be avoided are the commonly-used (and pejorative, and frequently accurate) “climate change denier,” as well as the name preferred by the very folks we’re talking about: “skeptic.” The AP, who excel at reporting both sides of the story even where only one exists, made the change in an effort to balance competing interests: the Committee for Skeptical Inquiry, representing scientists working to debunk all sorts of pseudoscience and conspiracy theories, argued that “skeptic” is simply incorrect on a factual level, while the “doubters” claim their opposition to the term “denier” is rooted in an association with Holocaust denial. In an interview of AP science writer Seth Borenstein, who helped created the new rules, Bob Garfield of On the Media takes on the AP’s tendency toward false balance, to somewhat explosive results. It’s absolutely worth a listen. Ok, good point. (Of course, it also doesn’t make any sense. To reject the climate would be what, exactly? Closing a window and turning on the air conditioning?) How about we go with “science rejecter” instead?